Large garden storage solutions can help to reduce household and garage clutter freeing up much needed space and are an obvious way of storing garden maintenance equipment, but which style and type is right for you and what do Pent and Apex mean? Garden Buildings Direct’s extensive range of Wooden Garden Sheds has products that will accomplish most common garden storage requirements and this guide sets out to decipher the terminology used to describe such products and to help you work out which is the right Garden Buildings Direct Wooden Shed for your individual needs. 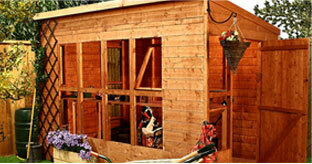 An apex shed is probably the type most commonly thought of when thinking about a garden shed. It has a pitched or inverted ‘V’ shaped roof creating ridge height and access is normally granted through a single or double door positioned on the front gable. Windows are located, except on the Value Range, down one of the side panels. 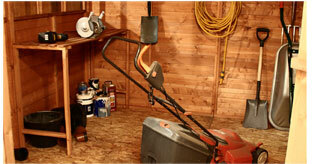 A Pent Shed changes the orientation and positioning of the garden shed when compared to the apex shed. Instead of a pitched symetrical roof the pent shed has a sloping roof with the highest point being situated at the front of the building and reducing in height at the back. Access is granted from the front of the building as opposed to the gable ends of the apex shed. Windows are located on the same front panel as the door. 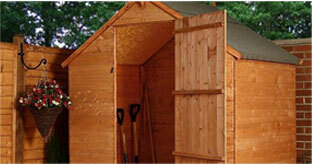 Garden Building Direct has Pent Sheds ranging in size from 8’ x 6‘ up to 10’ x 6’. When you require a larger sized Apex shed for a more productive environment or if you just need more storage space then Garden Buildings Direct’s range of workshops offers you a set of buildings that fit these needs. Built in modular form, connecting multiple floor, side and roof panels Garden Buildings Direct’s Workshops can be built with up to 200 square feet of floor space. 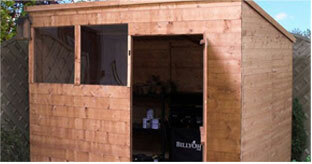 Garden Building Direct has Workshops ranging in size from 10’ x 10‘ up to 10’ x 20’. Given that Garden Building Direct has some of the lowest prices for garden buildings on the internet it may surprise you to find that we have designed a range of buildings that have an even more amazing low price in our Budget Range. By way of a bit of Garden Buildings Direct magic, selected materials and construction know-how you can have an apex shed that beats the market in quality and price. 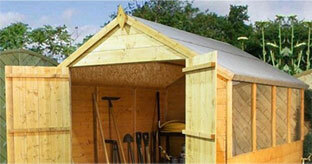 Garden Building Direct has Value Apex Sheds in size from 4’ x 6‘ up to 12’ x 6’. Why do all sheds have to look the same? At Garden Buildings Direct we believe they don’t have to and that’s why we have buildings that have a more creative design to them. They have all the same quality and performance attributes as the sheds do, but they will help to give your garden a more individual look. Some of Garden Building Direct‘s more stylised offering are named: BillyOh Country ‘Stable’ Shed, BillyOh Big Barn and BillyOh Country ‘Plant House’ Potting Shed. See our Facebook page for all the latest competitions and events! Copyright Garden Buildings Direct Blog 2015. All rights reserved.